I feel an assessment of the then Chief of the Army Staff, General Chowdhary, is called for. I will be the first to admit that he had a very sharp brain, and could speak and write well, in English. His greatest failing was that he had an exalted opinion of himself. ‘He often passed smart alec remarks and doubted the intelligence of everyone (around him. As a soldier, I regret to say, he left much to be desired. How else can you explain that throughout the duration of the War with Pakistan, he visited my Headquarters only thrice, that is on the 10th, the 14th and the 20th of September. And yet, on the early morning of the 23rd of September, soon after the cease-fire was announced, he was the first one to go to the Ichhogil Canal, with a photographer, and have his photograph taken for the press? Subsequently, to prove that he had participated fully in the War he had a book written by a well-known journalist which was completely fictitious. With Indian Prime Minister Narendra Modi set to visit Russia on July 7, speculation is swirling about the potential for a final agreement between the two countries regarding a jointly developed and produced Fifth-Generation Fighter Aircraft (FGFA). Since March, reports have circulated that India – faced with combat aircraft capacity pressures – is willing to exhibit greater negotiating flexibility with the Russians in order to move the program forward. In addition to the non-stealth Dassault Rafale as its preference for a medium swing-role fighter, India has long viewed the FGFA as critical to meeting its air force's advanced jet fighter requirements. As centerpieces of India's future strategic airpower component, both platforms are considered crucial in terms of providing more modern fighter options while also helping fill the Indian Air Force's (IAF's) goal of fielding 42-44 fighter squadrons by around 2027. Basic infrastructure issues such as poor governance, corruption, and unclear planning haven’t deterred Pakistani citizens from forming community-based initiatives to help the victims of the recent heat wave. Due to escalating temperatures, the current heat wave in Pakistan has taken over 1000 lives while many others continue to suffer in the grueling conditions. According to the United Nations, Pakistan is one of the most water stressed countries in the world and electricity shortages have added to the growing problems in the country, especially for the impoverished community. Incidentally, June is also the month (this year) when many Muslims are observing Ramadan and fasting from sunrise to sunset. Due to deeper a sense of spirituality, many people continue to fast despite the difficulties.Clerics and scholars have repeatedly told Muslim citizens in Pakistan that those who cannot bear fasting in difficult conditions can delay it. The audacious attack on the well-protected Afghan parliamentary building on June 23 demonstrates the Taliban’s continued ability to strike dead in the heart of Kabul, but more importantly also suggests that the battle in Afghanistan is just as much about politics as it is about military forces. While the causalities from the attack were not as great as in other high profile attacks in Kabul, the widely broadcast footage of the well attended session being interrupted by the initial explosion and the highly symbolic nature of the target was meant to send a clear political message. First of all, the timing of the attack is important. In recent days, the Taliban have made significant territorial gains in both the north and the south of the country. While informal peace talks have occurred recently in Qatar and Norway, progress has been limited. Part of this, some have suggested, is the Taliban’s conviction that the central government is currently in a position of weakness. How Did China Just Win Thailand’s New Submarine Bid? Thailand’s navy has elected to buy three submarines from China, moving the country one step closer to acquiring a capability it has lacked for more than six decades, media sources reported June 26 (See: “Thailand Eyes Submarine Fleet”). According to The Bangkok Post, a source on the 17-member submarine procurement committee appointed by the Royal Thai Navy (RTN) revealed that a majority of its members had voted to buy three Chinese submarines costing 12 billion baht ($355 million) each because they were the “best value for money.” The rest of the committee members were apparently split between submarines from South Korea and Germany. As I have written previously, Thailand has lacked a submarine capability since 1951 and has tried but failed since the 1990s to ink submarine deals with several suppliers, including Seoul and Berlin (See: “Will Thailand Realize its Submarine Quest?”). China has moved an oil rig that was at the heart of a dispute with Vietnam last year to waters near Vietnam again, according to multiple news report. Yesterday, Vietnamese newspapers began reporting, citing the Chinese Maritime Safety Administration (MSA), that China’s Haiyang Shiyou 981 (HD-981) oil rig was being moved to waters where China and Vietnam’s Exclusive Economic Zones (EEZs) overlap. According to the news reports, the platform is now located 17°03'75’' North latitude and 109°59’05’’ East longitude. In the statement, MSA warned that all ships must stay 2,000 meters away from the rig. The HD-981 will explore for oil and gas in the region between now and August 20, according to the MSA statement. The long-awaited vote by Hong Kong’s legislature on reforming the method of selecting the Chief Executive (head of government) took place on June 18. Legislators rejected the government’s proposal – based on a framework issued in Beijing on August 31, 2014 – to introduce a popular vote for two or three candidates following nomination by a committee of 1,200 mainly pro-establishment figures. The reforms needed two thirds of the legislature’s 70 votes to pass, but ever since the August framework was announced, 27 “pan-democrat” legislators had promised to veto any change. In the end 28 legislators opposed the government’s proposal and only eight voted in favor, after a bizarre walk-out by 31 pro-government legislators attempted but failed to delay the vote. Can Air Power Defeat the ISIS? The USA decided to lead a coalition of countries to stem the Abu Bakr al-Baghdadi-led ISIS expansion. The ISIS has around 70,000 fighters including 8,000 in Libya and 10,000 in Nigeria. It is also estimated to have at least one attack helicopter, three MiG-21 and five drones. A large number of regional players who felt threatened by the rise of ISIS entered the conflict in support of the Western alliance. Iraqis were tasked to fight the ground war and the Coalition was to handle the air campaign to make it convenient to regain territory. Two recent events, the internationally supported Iran nuclear deal and the Saudi led attack on Yemen has added a new dimension. The air campaign that began on August 08, 2014 has now accelerated and finally started showing results. The US-led air campaign in Iraq and Syria has now been designated as Operation Inherent Resolve. Are the Iran Nuclear Talks Too Big to Fail? "...today we understand that almost any deal is considered better than no deal." Is failure an option when it comes to the Iran nuclear talks? The short answer to this question—at least for the United States—is emerging as “no.” While for the longest time we were urged to trust the international negotiators that “all options are on the table” for dealing with Iran, in reality, they are not. Only one option is on the table, and that is diplomacy. In and of itself, diplomacy certainly is the preferable option, but its value depends on how it is played. Indeed, for the past year and a half, we have been told that the alternative to the negotiations—indeed to every single step the negotiators have taken over the past eighteen months—is either a nuclear Iran or war. Two workers are protesting what they call illegal labor practices by Kia Motors. About two weeks ago, two informal workers at Kia Motors, Choi Jeong-myong and Han Kyu-hyop,lowered a moderate sized banner across an electronic display board at the National Human Rights Commission of Korea, a building located next door to Seoul City Hall. The banner exhorted the chairman of the Hyundai-Kia Automotive Group, Chung Mong-koo, to “take responsibility for irregular and regular Kia Motors employees.” Thus began the latest “high-altitude sit-in” (gogong nongseong) against labor market conditions in South Korea in what is becoming a regular symbolic and cultural expression of discontent with the changes made to the Korean labor market over the last few decades. In particular, this sit-in protests unlawful labor practices by Kia Motors. According to a Media Today report, after being accused of unlawfully employing more than 3,000 new workers (the terms of their employment are not specified), Kia promised to move more than 450 of them to regular employment positions by next year. This promise, apparently, is not being honored. Rather than offering permanent employment, Kia is supposedly hiring the worker under “special employment” conditions — a move considered both dishonest and illegal by the employees and their union representatives. A report suggests Moscow is trying to counter Beijing’s influence in Central Asia. But the evidence is thin. Russia’s beefing up its air and missile defense systems near its borders with NATO countries, according to local media reports. This week, Sputnik reported that Russia’s Western Military District is increasing the number of S-400 Triumf and Pantsir-S air defense systems in its area of operations. "Modern S-400 Triumf long-range air defense systems and Pantsir-S gun-missile air defense systems will be put in service with air defense units of the Western Military District by the end of this year," Col. Oleg Kochetkov, a spokesperson for the Western Military District, said, Sputnik reported. The S-400 is Russia’s most advanced air and missile defense system, and its deployment in greater numbers along Russia’s borders with NATO could challenge the latter’s ability to achieve air dominance in the event of a conflict with Moscow. The Balts, Nordics and Poles have a rare collective opportunity to team up with NATO against Putin. But will they? NATO’s credibility is at stake in the Baltic. A glance at the map shows all too clearly that reinforcing the Baltic states in a crisis is hard without the help of non-NATO Sweden and Finland. In fact, it’s impossible—unless the West is willing to react to a Russian invasion or other provocation with nuclear weapons. The choice is stark: See the end of NATO, or risk World War III. Vladimir Putin knows this. He is systematically provoking the countries of the region to highlight the Kremlin’s relative strength. Russia has kidnapped an Estonian security official. It threatens and practices the use of nuclear weapons. It has warned Sweden and Finland not to even think about joining NATO. It runs a relentless propaganda campaign against the Baltic states. It carries out dummy attacks with nuclear-capable aircraft. It flies warplanes around the region with their transponders switched off, endangering civilian aircraft. Greece could be on the brink of defaulting. What comes next? Right now it looks as though Greece will default. Even if it does, Athens could still cut a deal later. Either way, it will remain unclear for a while whether the country stays in the common currency. In some respects, this situation is entirely manageable. That fact has fostered a dangerous complacency, for in other respects, this situation carries considerable risk for the eurozone, for European finance generally and for global finance. As many media discussions have implied, the debt part of the financial equation is not especially threatening. Greece for one, is a small economy. Its gross domestic product (GDP) is barely 6.5 percent of Germany’s. For another, its outstanding debt amounts to barely 1 percent of Europe’s banking assets. Even if that debt were widely held, default would hardly threaten the continent’s financial stability. And since the debt is now largely held by governments and other official bodies, the financial system has an additional buffer against uncertainty. Meanwhile, the ECB’s bond-buying program should stem any fears that Greek default will force unsustainable borrowing costs on Italy, Spain and others in Europe’s troubled periphery. The United States will need to spend as much as $18 billion per year for 15 years starting in 2021 to keep the nation's nuclear stockpile and the weapons and vehicles designed to deliver these weapons viable, Pentagon leaders told lawmakers. "We've developed a plan to transition our aging system. Carrying out this plan will be an expensive proposition. It is projected to cost DoD an average of $18 billion a year from 2021 through 2035," Deputy Defense Secretary Bob Work told members of the House Armed Services Committee at Thursday's hearing on nuclear deterrence. "The only existential threat to our nation is a nuclear attack. Nuclear weapons remain the most important mission we have," he added. Work explained that keeping the country's nuclear enterprise modernized is especially important in light of the advancements made by Russia and China. "A judicial victory doesn’t automatically translate into a political victory, let alone a policy success." In March 2003, senior U.S. diplomats flew to Geneva to meet with Iran’s then UN ambassador (now foreign minister) Mohammad Javad Zarif. Their agenda was straight forward: Win Iran’s pledge not to interfere in Iraq. Zarif readily agreed. Two weeks later, Operation Iraqi Freedom began. Two thousand Iranian-trained militiamen flooded into Iraq and, over subsequent years, Iranian weaponry or proxies murdered hundreds of Americans. Zarif either lied outright or exaggerated his ability to make firm commitments to which all Iranians would adhere. Nevertheless, on September 27, 2013, President Barack Obama announced that he had spoken on the phone with Iranian president Hassan Rouhani, and suggested he could trust that the Iranian leadership. “Iran’s supreme leader has issued a fatwa against the development of nuclear weapons [and] President Rouhani has indicated that Iran will never develop nuclear weapons,” Obama said. To many, America is synonymous with freedom. The country dubbed itself the "land of the free" and, when trying to reclaim sliced and fried potatoes from the French, briefly attempted to rename "French fries" as "freedom fries." Yet America's global reputation for personal freedom has taken a beating over the last couple of years. Data from Pew Global Research suggests a dramatic fall in the number of people around the world who say the U.S. government respects the freedom of its people. The issue may be most stark in Germany. Back in 2013, a whopping 81 percent of Germans polled by Pew thought that the U.S. government respected personal freedom. Then, in 2014, it was 58 percent. Now, according to figures released by Pew this week, just 43 percent of Germans think the U.S. government respects the freedom of its citizens. Fifty-three percent think it doesn't. PRESIDENT OBAMA’S wide-ranging review of U.S. policy toward the taking of hostages abroad has resulted in some useful adjustments in government organization and procedure, and in one serious misstep. Beyond a doubt, the recent spate of captive-taking, ransom demands and brutal murders in Syria and Yemen has devastated the families of victims and exposed confusion and indifference by U.S. government officials. A lengthy New Yorker article by Lawrence Wright described the families’ anguish, along with a private effort to assist hostages that was organized by David G. Bradley, the head of Atlantic Media. At the White House, Mr. Obama seemed to be caught up in the emotional despair of these families, saying he shared their grief not only as president but also as a father and husband would. Amidst increasing alliance concern that the United Kingdom is approaching the point at which ‘little Britain’ may, in military terms, be both perception and reality, the British government has embarked upon a new Strategic Defense and Security Review (SDSR). The auguries aren’t good for Defense, which has already had to find £500 million to satisfy the Treasury. For the defense effort as a whole, the key problem is the need to replace the fourVanguard-class nuclear-powered ballistic missile submarines. This program can’t be delayed without risking the continuous at-sea deterrent, the holy grail of the British deterrent, which has been sustained, albeit sometimes under great strain, for more than four decades. Both the Conservatives and Labour have committed to the successor force, while a number of studies have confirmed that the submarine-borne ballistic missile remains the most effective mechanism for maintaining a nuclear strike capability. The TPA Victory: America's Place in the Pacific Century Secured? "Obama and his unlikely Republican allies can justly celebrate a victory, and not only for the pivot and economic opportunity." SYDNEY--It was rare moment for bipartisanship in Washington and an even rarer coalition that made it happen. But in seeing through the passage of trade promotion authority (TPA), or “fast-track”, a White House-Congressional Republican alliance bucked intense opposition from organized labor and other advocacy groups, clearing the way to achieve significant new free-trade arrangements for the 21st century. A neophyte watching Congressional votes over the past week could be excused for assuming President Obama was the leader of the Republican Party, working together to salvage a deal. An easy mistake to make considering a majority of his actual party on Capitol Hill—and with Democratic presidential contender Hillary Clinton equivocating at best—nearly torpedoed TPA, legislation that had been granted to every post-war president, but Richard Nixon. In recent decades the ubiquitous NGO has taken up the banner for charities and worthy causes. From the environment and human rights to health, education and animal welfare, nongovernment organizations have championed the dispossessed, winning legions of fans. But in recent years pockets of NGO Land – as some call it – have lost their shine. Too militant, too strident, and too sanctimonious are among common complaints leveled at NGOs – whether in Australia or in Southeast Asia and beyond — amid allegations of blatant lying and a victory at any cost mentality. It was a point noted by academic and veteran correspondent Karl Wilson, from the Asian Centre for Journalism in The Philippines, who spent time working with a prominent human rights group. Author’s Note: Click on the headline below to see the excellent graphics accompanying this report. Following Saudi airstrikes in Yemen during late March, the Iran-Saudi cyber conflict escalated. OSINT reveals a rapid exchange of website defacements and social media account hijackings between Saudi and Iranian hackers during mid-April. This period began when pro-Saudi hackers, unusually the aggressors,attacked Fars News Agency’s website on March 31. This incident appears to have spurred pro-Iranian hackers into action as detailed below. WASHINGTON—The top U.S. intelligence official signaled Thursday that Chinese hackers were behind the theft of millions of personnel records from the federal government, marking the administration’s most pointed assignment of blame since the breach was announced June 4. Mr. Clapper’s pointed remarks come as U.S. officials are debating how and whether to retaliate against Chinese officials for the breach of records and background investigation data from the Office of Personnel Management. Officials are still studying how many people were affected, but they believe 18 million Social Security numbers could have been compromised. President Barack Obama in April signed an executive order that would make it easier for the Treasury Department to impose sanctions against any person who conducts a cyberattack that represents a “significant threat” against the U.S. government or a U.S. firm. The successor to the 20-year-old European data protection directive has inched closer to becoming law, having been approved by the Council of Ministers, which represents each of the 28 EU member states. This has led to howls of anguish from some parts of the computing industry, not just the usual suspects based in the US such as IBM and Amazon, but also European firms such as German software company SAP. Data protection law governs who can gather and retain personal data, the circumstances under which it is allowed, and what they can do with it. The move to an increasingly digital economy makes this vital to get right: too little protection erodes trust and leaves businesses and individuals vulnerable, while overbearing rules make it difficult for organisations to work together. The new General Data Protection Regulation (GDPR) aims to encompass the technological changes since its predecessor was enacted, such as the rise of social media and cloud computing. Polish prosecutors are looking into whether the outage which grounded dozens of jets operated by Polish airline Lot at Warsaw’s main airport on Sunday may have been caused by a computer system error, a spokesman for the Warsaw prosecutor’s office said on Wednesday. The prosecutor’s spokesman said computer error was one of the versions being examined. The carrier has said the outage was caused by a cyber attack. Around 1,400 passengers were stranded at Warsaw’s Chopin airport when the flight plan system went down for around five hours on Sunday. The airline said the problem did not affect flights in the air, and passenger safety was not compromised. Every week, I scour the the Internet for the best articles, analysis, and multimedia on foreign policy and national security just for you, dear reader. You’re welcome. Don’t blame China for the OPM security breach. “Fingers quickly pointed to China, and why not? The Chinese have pretty much had a freehand in American databases for the better part of a decade and the attacks fit their policy, their needs, their tactics and their tools. The only thing missing was a formal American accusation. But let me quickly add that I do not blame the Chinese. If we determine that China did this, we would be assigning responsibility, but blame is a different matter. I blame China when they penetrate American industry (an unfair nation state vs. private company fight) and rip off intellectual property for commercial gain (something we view as criminal).” — Retired Air Force Gen. Michael Hayden on how Congress’ failure to pass cyber security laws that would have offered better protection is to blame for the recent OPM security breach, not China. "Wars start all the time, often unintentionally by parties that have far too much to lose." China and Japan have gone to war three times since 1894. At the end of the Second World War, with Japan in ruins and under Allied control, it seemed unlikely the two countries would ever fight again. War between the two countries seemed even more unlikely after the adoption of Japan’s pacifist constitution, which disavows war as an instrument of national policy. At the time, China was a poor, largely agrarian society barely capable of defending itself. The rise of China over the last thirty years has dispelled the notion that the two powers will never fight again. China’s military, fueled by decades of double-digit budget increases, is now the region’s largest. The late Robert Heinlein wrote Starship Troopers, one of the Cold War’s best military novels — a scifi adventure set in a frightening, fascistic near-future and exploring universal, unchanging truths about combat, leadership and soldiering. Heinlein, who died in 1988, also wrote one of the Cold War’s worst novels — the execrable Farnham’s Freehold, which I picked up on a whim last week at Angel City, a quaint used-book store in Santa Monica. It was $2.95 well spent, but only in a cautionary sense. Farnham’s Freehold, a sorta-satirical speculative adventure about surviving atomic World War III, is as silly, alienating and tone-deaf as Starship Troopers is weighty, engaging and timeless. Farnham’s Freehold, first published in 1964, concerns former U.S. Navy Seabee-turned-middle-class survivalist Hugh Farnham, his petulant grown son Duke, hysterical alcoholic wife Grace, teenage daughter Karen and her friend Barbara plus Joe, the family’s … ugh, I can’t stand writing this … household servant. It should go without saying that Farnham & friends are white. Joe is black. Sadly, this is very important to the book’s perplexing, uneven plot. Autonomous weapons could be a military game changer that many want banned. Before considering such a move, we need to refine the debate—and America must demonstrate leadership. Autonomous weapons that select and engage targets on their own might sound far-fetched, but 90 countries and over 50 NGOs are taking their possible development seriously. For two years now, they have come together for sober discussions on autonomous weapons at the United Nations Convention on Certain Conventional Weapons (CCW), most recently in April 2015. Talks are progressing, but the glacial pace of international diplomacy is out of step with rapid advancements in autonomy and artificial intelligence. The lesson from the Manipur episode is that the 'keeping the lid on' strategy is not working and must be replaced with an outcome-oriented dialogue. Following the cross-border raid in Myanmar, National Security Advisor Ajit Doval's recent flying visit to NayPyiDaw was to invoke the 2014 Memorandum of Understanding on border cooperation so that sanctuaries provided to the Nationalist Socialist Council of Nagaland (Khaplang), the perpetrators of the June 4, 2015 ambush, are denied and mechanisms devised to coordinate border security better. The standard loadout for this plane includes eight AGM-84 Harpoon missiles, four AGM-142 Raptor missiles, 51 500lb bombs, 30 1,000lb bombs, 20 AGM-86C conventional air-launched cruise missiles (CALCM), 12 joint stand-off weapons (JSOW), 12 joint direct-attack munitions (JDAM) and 16 wind-corrected munitions dispensers (WCMD), according to Airforce-technology.com. In 1955, when the first Boeing B-52 Stratofortress became operational, nobody would have imagined that the plane would likely remain in service for nearly 100 years. Today, that's exactly what the US Air Force has in mind for this iconic aircraft. Around 750 of the bombers were produced. Although the latest model of the plane came off the assembly line in 1962, the Air Force intends to keep flying these planes until 2040. 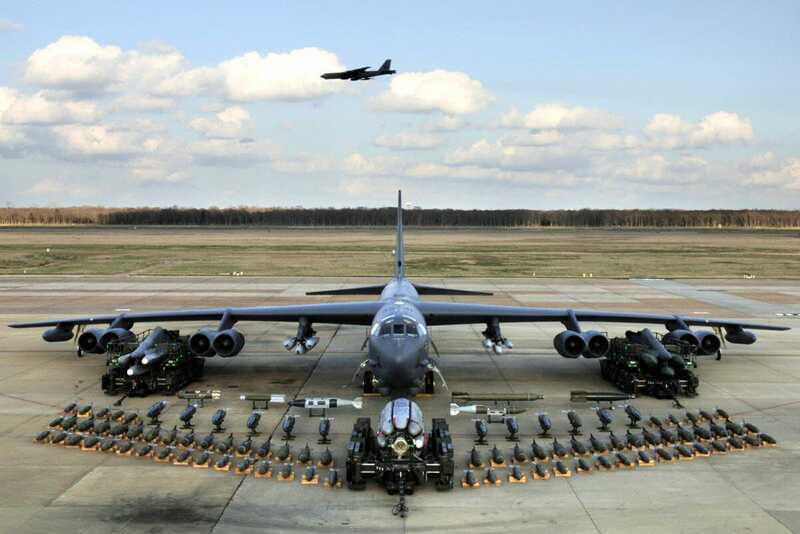 The B-52 is a multi-purpose heavy lifter of the skies, that has carried drones, space shuttle components, cruise missiles, and even nuclear bombs. Critics see event as an attempt to appropriate memory of former Prime Minister Lal Bahadur Shastri from the Congress. If the Yoga Day extravaganza on Rajpath on June 21 gave a sense of the Narendra Modi government’s talent for the mass mobilisation of sentiment, it is going to put that expertise to use again soon for another spectacle – one that will be even more grand and will last for almost a month. The proposed golden jubilee commemoration of Indo-Pak war of 1965 at the end of August are aimed at extolling India’s victory over Pakistan and at appropriating the legacy of former Prime Minister Lal Bahdur Shastri from Congress.